Unit #142 is in building 21, a two bedroom Garden View Paradise unit is in the heart of the Kiahuna gardens, this beautifully furnished two level unit is away from the noise of roads and parking lots, just a minute's walk to the beach and far enough from the lagoon so the frogs don't keep you awake at night. Two bedrooms and two bathrooms are downstairs, the living room, dining area and fully equipped kitchen are in the upper level. This is one of the few units with cathedral ceilings and huge bank of windows, giving unparalleled light and spaciousness. Outdoor living includes a furnished upper balcony lanai, as well as a ground level lanai off the master bedroom with huge lawns all around. This is a wonderful unit for families. The view from the lanais are of lawn and garden and the twin bridge beyond. Our guests have all the privileges available to any other Kiahuna guest, including free swimming, fitness room, and tennis at the Poipu Beach Athletic Club. A wonderful sandy swimming beach is only a quick bare foot walk across the Kiahuna lawns, where you can snorkel, swim, surf, and sunbathe to your hearts content. Complimentary beach towels and chairs are available at the beach hut. World-class golf is at the nearby Kiahuna Golf Club, or Poipu Bay Golf Club, home of the Grand Slam of Golf. Choose from over 20 excellent restaurants in the area, from shave ice and puka dogs to the elegant Plantation Gardens Restaurant right at Kiahuna. Or you can grab some fresh Opakapaka in Koloa and grill your supper on a barbecue right on the front lawn. We provide one maid service in a 7 night stay. Additional housekeeping can be arranged upon check in. Note: There is check out cleaning fee collected upon departure (currently ($205). This is our fifth visit to Kiahuna but our first time staying in this unit. We look for a few things: 1. Good location with direct access to the big lawns, 2. two bedrooms so mom and dad can get sleep separate from the kids, and 3. an end unit to get the wonderful island breezes. This unit hits all of those. The place is very comfortable and pretty well supplied. It does not have a washer-dryer (some units do) but the guest laundry is in great shape and easy to use. There's carpet in the bedrooms and upstairs -- not our favorite for our island visits but certainly in good shape. TVs were a little small but we didn't use them much and they had cable and DVD player hooked up. Beds were very comfortable and showers put out good pressure. If you stay here, don't miss the storage room off the upstairs front balcony. We did until our last couple days and it was full of snorkel gear, umbrella, beach toys, etc. Also, the door under the stairs opens -- it just needs a good tug. Well located 2 bedroom condo with kitchen and great access to the beach. We love the large lawn for the children to run on after a day at on the water slide or surfing the waves. Thank you! We had a great stay at Gordon's place. Excellent location for all activities, and the complex is very well maintained. Gorgeous sunsets at the beach. Kauai is the most tropical of the Hawaiian islands and the Kiahuna Plantation has to be the best location on the island. For a family island vacation there can't be anything better. 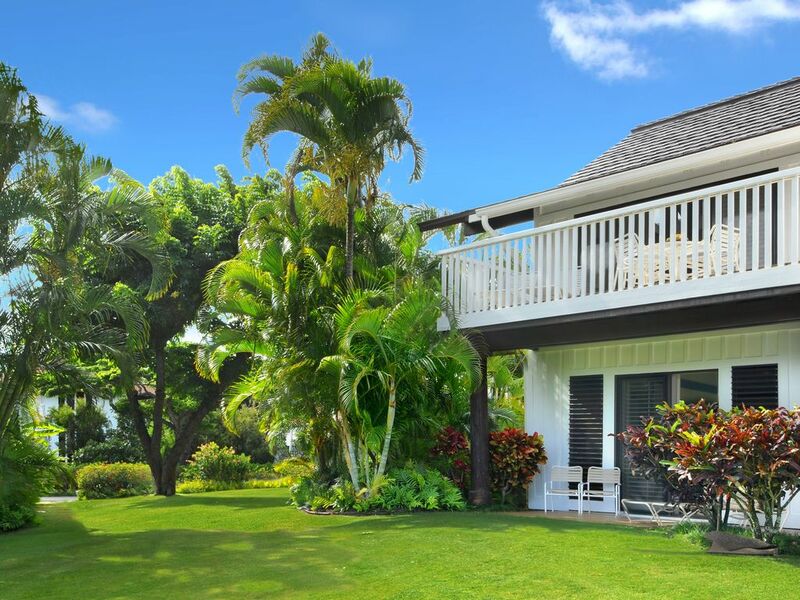 Kiahuna is 34 acres of manicured lawn and tropical vegetation. There are activities for all ages. Unit 142 is located off a large grassy area that was quiet, except for an occasional chicken (the State bird of Hawaii). Parking is convenient, as were two gas BBQ's. The pool was a short walk across the road and a big hit with the grandkids, especially the water slide and small cave. We picked up snorkel gear at Costco on the way there but there was some in the unit also boogy boards and sand toys. The sand beach is a short walk away. These units were build in the mid 70's without air-conditioning but ceiling fans work well. Washers and Dryers are located near the Castle office, again, a short walk. In summary, if you're looking for a true island experience, Unit 142 and Kiahuna will provide it. We thank the Ward's for their hospitality. What a great place for a vacation! This was a great place for our vacation; there were just 3 of us, but there was plenty of room for 6. The kitchen was fully furnished with everything we needed and was clean as a whistle, as was the entire unit. The walk to the beautiful sandy beach is less than 5 minutes, and most of that is over golf course type grass that is lush and carpet-like. Beach towels, chase lounges, and lawn chairs are provided at the beach! The outdoor pool a short distance across the street (towels, lounges, and umbrellas also provided) and the tennis court were an added bonus and we enjoyed both. There's also a nice shopping area just across the street, and several nearby restaurants. Couldn't ask for a nicer place to stay! We'll be back. We have stayed in this unit two times and have enjoyed the location and room it provides our family. It is a great location in the center of the property close to the beach and with a wonderful view of the grounds. If you like to relax or explore this is a great place to stay. There is a one time check out cleaning fee, currently $160, collected by our on site manager upon departure.